An exuberant addition to our Cube Storage line, these Cube Shelves will cover any space, maximizing your storage ability. Combine these sleek, modern shelves with our designer kids' storage bins and you have the perfect place to keep practically anything. Kid's books, toys, stuffed animals, or clothes find a home even without the bins. Don't forget, there's always the space up high for those art supplies and other things you don't want little hands getting into. The Cube Shelves feature our tool-less assembly technology so you can put them up and take them down easily. They also pack flat so you won’t have to worry about carrying a giant piece of furniture down the stairs when you move. 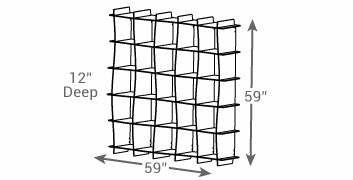 Our Large Wave Modern Bookcase requires no tools, no hardware, and is simple to assemble. Patented Tension Lock Technology uses the natural properties of wood to create a sturdy durable joint that can be assembled and disassembled repeatedly.